After two days of public hearings, Vancouver city council has voted to enable duplex use in the city's single family home neighbourhoods. 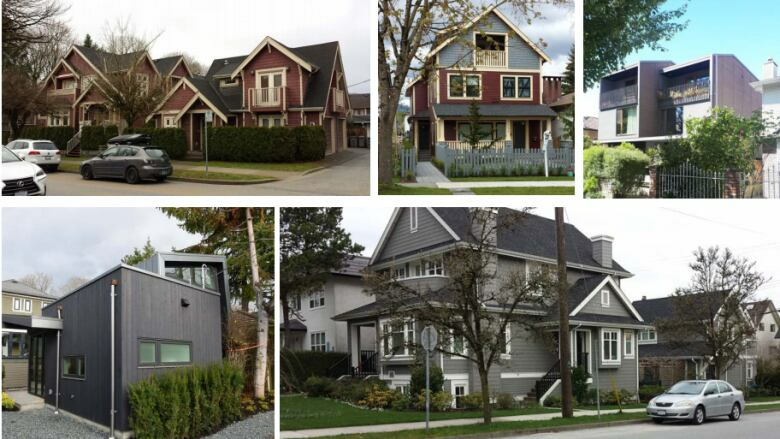 After two days of public hearings, Vancouver city council has voted to rezone the majority of the city to enable duplex use in single-family home neighbourhoods. The decision, approved in the final city council meeting of Gregor Robertson's decade-long tenure as mayor of Vancouver, is also one of his most sweeping policies. Under the rezoning, duplexes — houses divided into two apartments, with a separate entrance for each — are now legal in 99 per cent of all single-family neighbourhoods in Vancouver. According to the city, that comprises 67,000 single family lots, around 52 per cent of city's land mass. Seven councillors voted in favour, while four were against. The decision was meant to be voted on Tuesday night, but was pushed until Wednesday after dozens of speakers showed up to voice their opinion. Speakers were divided into two camps — those who felt that rezoning areas to allow for more density would provide housing options that Vancouver desperately needs, and those who expressed concern that rushing such vast changes through would come with undue risks. "We heard, on the one hand, that this was a tiny step going way too slow, on the other end that this was a massive step going way too fast," said councillor Andrea Reimer, shortly before she voted yes. Reimer compared many of the concerns about the rezoning to those expressed before Vancouver began allowing laneway homes. "There was a sense that neighbourhoods would literally come to an end ... it turns out those hypotheses did not come to pass," she said. Councillor Melissa De Genova voted against the zoning change. "You can't just have a blanket policy, it doesn't just work everywhere," De Genova said. She also attempted to introduce a motion to pass the decision to Vancouver's next city council. Councillor George Affleck, who also voted against, said there was a lack of consultation on the proposal, and said "we're tearing this city apart, we're tearing neighbourhoods apart." Robertson said he was proud of the move to increase density. "This is not the silver bullet, this is the important next step to produce more housing options," he said. "I hope the next elected council is willing to take next steps, we'll see more triplexes, quadplexes and beyond. "It's going to take sustained effort for many years to come."